A 3 day toxicity testing test of the direct (intrinsic) effects of chemicals on the germination and early growth of plants. The Phytotestkit is a variant of the Phytotoxtkit which allows to determine the direct (intrinsic) effects of growth inhibiting (toxic) chemicals and growth promoting chemicals on the germination and early growth of plants, without prior incorporation of the chemicals into a (reference) soil. Each PHYTOTESTKIT contains all the materials necessary to perform one complete test with one monocotyl and two dicotyl plant species, in 3 replicates. The assays are performed in special transparent test containers which allow for direct observations and length measurements by image analysis at the end of the test. 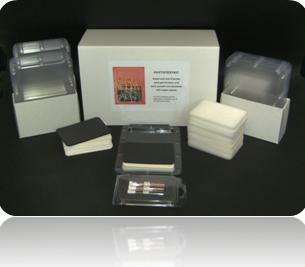 Easy to follow instructions and detailed illustrations are provided in the kits for the conduct of the very practical assays. Calibrated high quality seeds of the 3 selected test plants are included in the kits for the germination and early growth tests. · In accordance with conventional phytotoxicity assays the selected plant species encompass monocotyls as well as dicotyls. · The plants selected for the Phytotestkit microbiotest are: the monocotyl Sorghum saccharatum (Sorgho) and the dicotyls Lepidium sativumSinapis alba (mustard). · Phytotestkit tests can, however, also be applied with any type of seeds, with adaptation of the exposure time in function of the speed of germination and growth of the plants. · Germination of the seeds and growth of the roots (and wherever appropriate also the growth of the shoots) of the 3 selected plant species, upon “direct” exposure of the plants to solutions of chemicals spiked onto a thick filter paper, in comparison to germination and growth in a control, on a filter paper without chemical spiking. · The high quality seeds, the special standard test containers and materials are a guarantee for the high repeatability and reproducibility of the assays, in comparison to conventional assays on plants. · Very rapid set up and scorings which allow handling multiple tests concurrently. 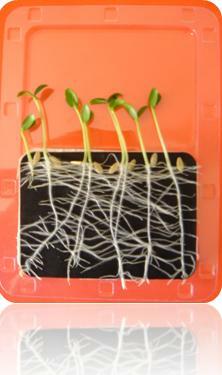 · Direct observation of the germinated seeds and automatic measurement of the roots (and shoots) in the unique transparent test containers, by image analysis. A simple and convenient image analysis program can be provided free of charge on demand. · Vertical incubation of the flat test containers in their holders, requiring a minimum of shelf- and incubation space. · Image capturing of the germinated seeds in the test containers with any type of “digital” equipment (camera, webcamera or flatbed scanner). · Analyses and measurements can be deferred (since the “pictures” of the test plates are stored on computer) which is a major asset in comparison to conventional tests on plants. · 18 transparent test containers each provided with a foam pad, thick white filter paper and black filter paper - 3 cardboard holders for the test containers and 3 tubes with seeds of the 3 test species. · Detailed Standard Operational Procedure brochure and abbreviated Bench Protocol. · Specification sheet with batch number of the seeds.